Spread across 40 acres of land, Lal Bagh is one among Bangalore famous gardens. Located in South Bangalore, on the Lalbagh road, this botanical garden is an ideal place to spend a few relaxing moments amid the refreshing greenery. Presenting a perfect break from the concrete and traffic of the city, this garden has become one of the top places to see in Bangalore. A visit to this garden is sure to bring a smile on your face. Undoubtedly one of the most beautiful gardens in the country with properly planned layout, rich collection of rare plants, maintenance of paths and open spaces. 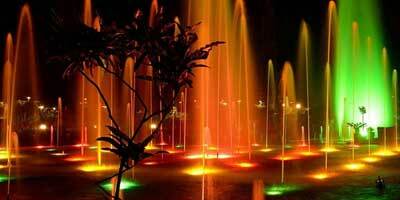 What makes Lal Bagh Bangalore special are the creatively designed lawns, water pools, fountains and flowerbeds. It also showcases rare plant species that have been brought from places such as Persia, France, Afghanistan, etc. An ancient rock formation is another major attraction of this botanical garden. Earlier known as Rose and Cypress Garden, Lal Bagh means the Red Garden, denoting the extensive variety of flowers and plants in this garden. This garden can be accessed via four main gates. Along with this, botanical garden Bangalore also presents many interesting structures that are worth noticing. Some of these are Glass house, Statue of Sri Chamaraja Wodeyar, Aquarium building, Deer Paddock, Kempegowda Tower, Lalbagh lake, tree fossil, pigeon house, lecture hall, museum, aviary, etc. 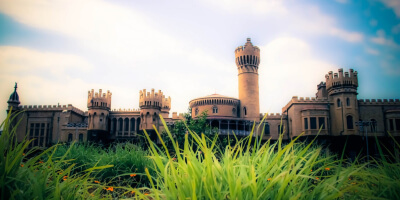 Facilities such as cloak room, drinking water, toilets, park benches, parking area, battery operated vehicles make your visit to Lalbagh botanical garden Bangalore hassle free. Lalbagh also houses many prominent buildings and centers for training and other activities such as plant exchange. Directorate Building, Horticulture Information Centre, Library, and Jaivik Krishik Society are few of the buildings in Lalbagh. Lal Bagh Botanical Garden boasts of more than 1000 varied species of plants. These plants have been obtained from all over the world and introduced and acclimatized in the garden. It is approximated that around 670 genera of plants and about 1850 plant species comprises of Lalbagh horticulture. Lalbagh Nursery is especially bestowed with rare varieties of plants, offering an opportunity for all the visitors to explore the fauna in detail. Some of the unique plant species that one can find in Lalbagh Bangalore are Amherstia nobilis, Cola acuminate, Brownea grandiceps, Artocarpus heterophyllus, Bixa Orellana, Averrhoa bilimbi, Cassia fistula, Dillenia indica, Michelia champaca, Butea monosperma, Castanospermum austral, Swietenia mahagoni, etc. Stalls - Lal Park in Bangalore has a wide array of stalls within its compound. These stalls sell horticulture products ranging from seeds, plants, flowers, gardening equipment as well as Vetiver handicrafts. This garden also has stalls for natural fruit juices and sweets and savouries, making the garden a perfect place to hang out where you are offered with not only lush greenery but also shopping and eating choices. These stalls are used for horticulture exhibition during the yearly flower shows. Glass House- Rightly called as the ‘Jewel of the Garden City’, Glass house is the most attractive part of Lal Bagh Bangalore. Its architectural style is similar to that of Crystal Palace of London. London’s Crystal Palace, however, caught fire in an unfortunate situation in 1936 and hence was remodelled. Glass house at Lal Bagh was proposed by John Cameron, Superintendent of the Botanical Gardens. It was built in the year 1889 and was again renovated in 2004. This glass house was built to mark grandson of Queen Victoria, Prince Albert Victor’s visit to India. Flower Clock- Inside the Botanical Garden, the first thing that capture visitors’ attention is flower clock that was set up in 1983 by HMT watch factory. This flower clock functions on the mechanism of electronic quartz. It has a dial which has a diameter of around 7 meter. There are statues of dwarves in front of the clock, which along with the beautifully decorated dial with colourful flowers, create a sight worth remembering. Lalbagh Lake: Lalbagh Botanical Garden also has a natural lake named Lalbagh Lake which is located on its southern end. Spread over 40 acres of land and a depth of 3.5 meters, Lalbagh Lake has two islands, which add further to its enchanting beauty. Around the lake, there is path that is lined with trees. It is a popular path for morning and evening walks. There is bridge over this lake that goes to the eastern end. A walk on this bridge with calm waters and greenery around promises a magical experience. Lalbagh Lake connects the two ponds in the garden, namely Lotus Pond and the Sunken Pond. Lalbagh lake is natural lake but its development was commissioned by James Cameron, the then Superintendent of Lalbagh in the year 1890. During his time, steps were built to the lake, a water weir to the lake was also built. The lake was developed primarily to serve the water requirement of the garden. Lalbagh Lake also boasts of being the first lake in Karnataka where the Khus Grass, Vetiveria Zizanioides, has been used to clean the water. Lalbagh Lake serves as a home to many migratory and aquatic birds as well. The islands inside the lake are ideal for breeding and nesting for these birds. Some of the commonly spotted birds around the lake are Black Pelican, Egret, Great Cormorant, Night Heron, Indian Pond Heron, Oriental Darter, White-breasted Kingfisher, Parakeet, cranes, swans, Little Cormorant, Spot billed Pelican , Grey Heron, White Pelican, etc. Topiary Garden- It is an attractive section of the botanical garden, especially for children, where plants such as Junipers and Cypress are projected in different animal shapes such as lion, tiger, elephants, etc. These plants are shaped and maintained on steel structure of animals. Tree fossil- Brought from Tamil Nadu state, the tree fossil is a carbonized trunk of coniferous tree that is around 20 million year old. It is placed between the Topiary Garden and Band Stand. Pigeon House-This is a small structure in cylindrical shape. It was constructed in 19th century to serve as a home for pigeons. It has the capacity of housing more than 100 pairs of pigeons. Bonsai Garden- Spread over 2 and half acres of land, Bonsai Garden comprises of more than 700 bonsai plants of varying species. These plants are 5 to 35 years old and exhibited specially during the annual flower shows. Pigeon Colony- Near to the West Gate, which is one of the Lalbagh Main Gate, pigeon colony is located. It was created in 2007. It is a triangle shaped platform set amidst the beautifully laid our garden. It was built with the purpose of attracting pigeon population. Lecture Hall- Originally built for conducting horticulture classes the lecture hall is located near the shade garden. With a royal Mysore emblem engraved on it, it presents impressive architecture. Guard Room-Located at the West gate of the garden, Guard room has a captivating structure. It has the structural shape of a lantern which is made up of granite. Its glass windows make the structure even more attractive. Band Stand-Constructed in 1870, during the British era, Band stand was the place where army personals used to relax and play. It was used for organising flower shows in 19th century. Bombax tree- This massive tree is something that you cannot miss when at lalbagh. It is located near the West Gate. This old tree is adjacent to the Topiary garden. Kempegowda Tower- Kempegowda tower, is one of the four famous towers which were built by Kempegowda in 1597. This tower was built to serve as territorial mark and a watch tower. An artistically built tower, it stands on a huge rock. It is well maintained. LalBagh Rock- One of the oldest Peninsular Gneiss rocks in the world, Lalbagh rock is said to be more than 3000 million years old. On this hillock, the Kempegowda tower has been built. Lalbagh Gates- Lalbagh Botanical Garden Bangalore has four entrances. The garden is surrounded by stone walls from all the sides with four gates. Lalbagh main gates are North Gate, South Gate, West Gate and East Gate. North Gate is towards the Subbaiah circle. This also serves as primary exit gate. The other one is West Gate, which is near Siddapur Circle; it is towards the Basavangudi. East Gate is towards the Double Road. One can reach this gate if coming via Jayanagar area. South Gate, which is also referred as the main gate is close to the Lalbagh Road. A major attraction of Lalbagh Bangalore is the flower shows that are conducted every year on the eve of Independence Day and Republic Day. Lalbagh flower show with its unique display of flowers allure hordes of tourists. It is the most famous flower show in Bangalore. 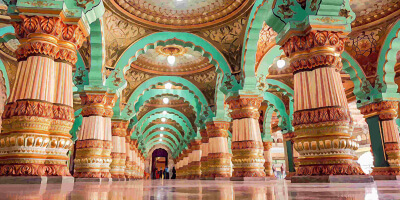 A must visit for both tourists and residents, Lalbagh Independence Day flower show is a 10 day long festival which is conducted conjointly by Department of Horticulture and Mysore Horticulture Society. At the flower show, flowers are displayed in interesting shapes varying from dinosaurs, woman, houses, etc. Lalbagh flower show timings are from 9 AM to 6 PM. The tickets for flower show can be booked online as well. Lalbagh flower show ticket price is Rs.50 per person for adults on holidays and Rs.40 per person on weekdays. The entry fee for children is Rs.10 per person. Lalbagh Bangalore was built as a private garden by Mysore ruler Hyder Ali in 16th century. It was then spread over 40 acres of land. This garden was designed in the style similar to that of Mughal gardens. As per Archaeological Survey of India and various other researches, Lalbagh is similar to a Mughal Garden that was located in Sira at Tumkur, around 120 km away from Bangalore. Lalbagh Bangalore was developed further by Tipu Sultan, son of Hyder Ali. It was Tipu Sultan who developed Lalbagh horticulture. Plants and trees from various parts of the world such as Cape Town, Persia, Kabul, Turkey, Mauritius, etc., were brought and nurtured in the garden. Later, this garden was developed during the British reign and further after independence. Some of the notable personalities who were also superintendents of the garden contributed significantly in the development of Lalbagh are Dr. Wallich, William Munroe, Major Waugh, Sir Mark Cubbon, William New, Krumbiegel, John Cameron, Dr. M.H. Marigowda, Dr. Cleghorn, Rao Bahadur H.C. Javaraya, K. Nanjappa and many others. In the year 1856, this garden was offered the status of Government Botanical Garden. Currently, Lalbagh botanical garden is spread over 240 acres of land and is maintained by the Directorate of Horticulture, Government of Karnataka. Lalbagh Bangalore Timings are from 6 AM to 7 PM. It is open on all days of the week. The entry fee of Lalbagh is Rs.20 per person for visitors above 12 years of age. Visitors are allowed to take camera inside with an extra charge of Rs.50. There is no entry fee for morning walkers at the park. The morning walk timings at Lal Bagh are 6 AM to 9 AM in morning and 6 PM to 7 PM for evening walks. Lal Bagh Bangalore is well connected to the rest of the city. There are regular buses that stop at one of the gates of LalBagh. The main bus stand, Kempegowda Bus Station is only 7 km away from the garden. Visitors can also hire an auto rickshaw or private taxi and reach the park without any trouble. Lalbagh is accessible via all the four gates while vehicles can enter only via the East Gate which is located towards the Double Road. It is around 4 km away from Vidhana Soudha, the State Legislature. Hence, tourists can club both the visits together. Lal Bagh Botanical garden is located on the Lalbagh Road, Wilson Garden. It is in the South Bangalore. Is there any Car Parking facility at Lalbagh Bangalore? Car parking facility is available at Lalbagh Bangalore. Ample of parking space is available from the East Gate of Lalbagh, which is towards the Double Road.